Arrival at Marrakesh Menara airport, welcome by the Euromaroc staff. Assistance and transfer to your hotel. Full day sightseeing of Marrakesh : The Menara gardens, The Bahia Palace, The Saadian Tombs, and the Koutoubia mosque.Lunch at the hotel. Afternoon, visit of the famous Djemaa El Fna square with its surrounding souks and handicraft centres. Dinner with oriental show, overnight at the hotel. Departure by land rover to Ouarzazate via the mountains of the high Atlas passing through the Tich’n’Tichka pass at an altitude of 2260 m.
Lunch in Ouarzazate and continuation to Zagora via the mountains of the Anti-Atlas. From Agdz, the track road is taken leading through numerous villages and palm groves along the Drâa river. Excursion to Tamegroute, visit of the famous library containing old books and documents dating from the 12th century. Visit of the sand dunes of Tinfou. Departure to Erfoud, partly by track road and partly by normal road, through Tansikht and Nkob where splendid sceneries of pre-saharian desert dotted with Berber villages, and of the Sargho mountain massive follow each other perpetually. Stop at Tazzarine, small Berber village, for lunch. Afternoon, continuation to Erfoud via the villages of Alnif and Rissani, birthplace of the present Alaouites Dynasty. Dinner and accommodation at the hotel. Early morning, excursion to see the sunrise over the sand-dunes of Merzouga, Back to the hotel for breakfast and continuation to the Tinghir Oasis, famous for its magnificent Todghra canyons which rocks reach an altitude of 250 meters. Excursion to the canyons and possibility for a short hike. Lunch at a restaurant situated at the feet of the canyons.Dinner and overnight at the hotel in Tinghir. Departure to Boulmane where we enter the Dades canyons for a visit. Via the road of the thousand kasbahs, continuation to EL Kelâa from where we take again the track road to the village of Skoura. 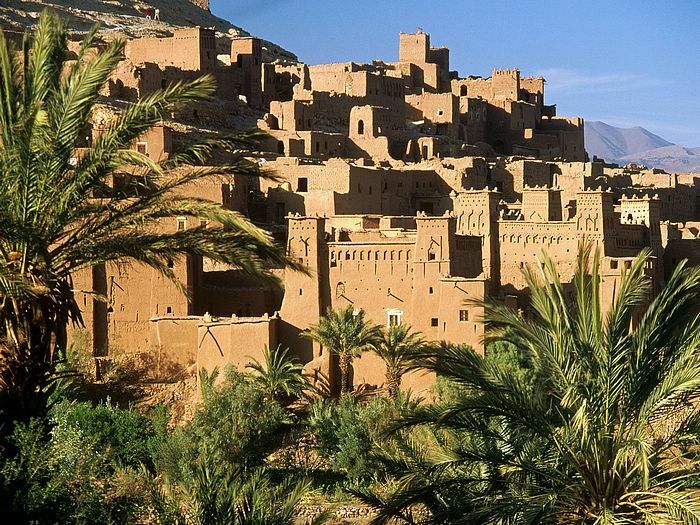 On the way, we pass the beautiful kasbah of Amerhidel. Lunch on the way. The track road continue till Ouarzazate following the feet of the Atlas mountains. Dinner and accommodation in Ouarzazate.